Getting the attention of your audience is getting harder every day. That's why you need to consider what supermarket aisles of Twinkies and doughnuts have in common with insurance marketing – and it’s more than you might think. 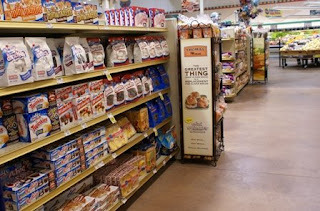 Consider thinking of the insurance marketing organizations or distribution partners you work with as supermarkets. Now you’ve probably spent a considerable amount of time and resources building relationships with these organizations. But so has your competition. Insurance wholesalers stock their hypothetical shelves with annuity and life insurance products they offer to producers. They also have many more products than prime shelf space. So the question for you is: What shelf is your insurance product on? Is it eye level at a prime spot with the Twinkies and the doughnuts? Or, is it on the top or bottom shelf like the Streusel Cake and dessert cups? The point is, you’ve made significant investments in building your product and getting the attention of the insurance marketer who can sell it. Now, how do you get your audience to pay attention to your marketing message and take action? How do you get your product or service to be top of mind – or as in our example – get that prime shelf space? It all starts with a good marketing plan. You must design comprehensive communication plans in a way that maximizes your marketing results. The next challenge is to get your audience to take action. Insurance promotional efforts are all too often the “me too” variety and not truly unique. Which camp do your promotional efforts fall into? Truly unique promotional efforts will put you on the prime shelf space and allow you to stand out from the crowd to attract more premiums. Truly unique campaigns, in short, digestible increments that speak to your audience are a must to be on the prime shelf space in today's insurance marketplace. Do you create unique campaigns that get your audience to respond to your message and your product? Share your thoughts by clicking on the "Add Comment" link below.